FKLI March futures contract traded unchanged to close at 887 as compare to previous trading session with total 8870 lots traded in the market. FKLI plunge from high at 895.5 levels as regional indices and Dow Jones electronic trading shows lack of strength after bull rally traded higher for almost 8 – consecutive days. Technically, FKLI seems tested the upper resistance trend line around 895.5 regions and traded lower since morning trading session. We expect FKLI would trade lower in the coming trading session provided if resistance levels at 888.5 and 899 were not violated. 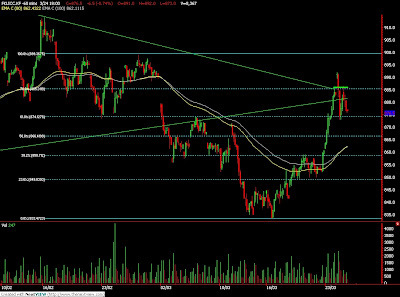 Traders were advice to hold short position in the coming trading session while be extra cautious around support levels at 874 and 864 regions. FCPO 3rd month June Futures contract fall RM45 higher to close at RM1990 as compare to previous trading session with 8264 lots traded in the market. A wild trading day for CPO price trading as intraday high and low were challenge few times as crude oil and soybean oil was traded wild as well. Technically, CPO price fails to breach upper resistance trend line of the rising wedge at RM2035 regions but instead manage to form a minor lower high downtrend line in C PO hourly price chart. We expect strong short signal would appear provided if support levels at RM1950 and RM1920 were violated in the coming trading session. Traders were advice to hold short position in the coming trading session while be extra cautious around resistances levels at RM2035 and RM2050 regions. March 27 (Bloomberg) -- Oil’s rally to a four-month high is vulnerable to a correction because near-term demand for crude isn’t yet strong enough to support a sustained advance, Goldman Sachs Group Inc. said. The discount for crude delivered in May, the front-month contract in New York, compared with July futures widened to as much as $3.47 a barrel this week from $1.18 earlier in the month. That indicates a surplus of oil for immediate delivery. U.S. oil inventories rose to a 16-year high last week. Oil for May has gained 10 percent since the Federal Reserve announced plans to spur a U.S. recovery by purchasing $300 billion of treasuries to bring down long-term interest rates. That raised demand for longer-dated crude futures on speculation the policy would boost economic growth coupled with concern the increase in money supply may spark inflation. The oil market has been in so-called contango, where spot prices are cheaper than longer-dated futures, since August as the economic slump cuts demand, causing inventories to rise. March 27 (Bloomberg) -- Crude oil in New York fell the most in two weeks as the dollar’s gain against the euro reduced the appeal of commodities to investors and stock markets declined. Oil dropped 3.6 percent after the U.S. currency rebounded against the euro on evidence the recession is deepening in Europe. A stronger dollar makes commodities less attractive as an alternative investment. Falling commodity prices and a report showing the U.K. economy contracted more than previously estimated sent stocks lower. Crude oil for May delivery fell $1.96 to settle at $52.38 a barrel at 2:51 p.m. on the New York Mercantile Exchange. The contract rose 0.6 percent this week. Prices are up 17 percent this year. The Reuters/Jefferies CRB Index of 19 commodities fell as much as 5.42 points, or 2.4 percent, to 222.26, the biggest one- day drop since March 2. The euro, which is used in 16 nations, fell the most against the dollar in more than a month after Europe’s statistics office said industrial orders in the region plunged in January. The currency declined as much as 2 percent to $1.3257, the biggest intraday drop since Feb. 17, and was at $1.3301 at 2:55 p.m. in New York. The Standard & Poor’s 500 Index declined 2 percent to 815.94. The gauge is up 11 percent in March. The Dow Jones Industrial Average fell 148.38, or 1.9 percent, to 7,776.18. Goldman Sachs Group Inc. said oil’s rally is vulnerable to a correction because near-term demand remains constrained. The discount for crude delivered in May, the front-month contract in New York, compared with July futures widened to as much as $3.47 a barrel this week from $1.18 earlier in the month That indicates a surplus of oil for immediate delivery. U.S. oil inventories rose to a 16-year high last week. U.S. oil supplies rose 3.3 million barrels to 356.6 million last week, the highest since July 1993, an Energy Department report on March 25 showed. It was the 22nd gain in 26 weeks and left stockpiles 13 percent higher than the five-year average for the period. Daily fuel demand averaged over the past four weeks was 19.1 million barrels, down 3.2 percent from a year earlier, according to the department. The 11 members of the Organization of Petroleum Exporting Countries bound by quotas will cut supplies by 0.2 percent this month as the group stalls in completing record production constraints, according to preliminary estimates from consultant PetroLogistics Ltd.
Oil supply from the 11 members with quotas will average 25.9 million barrels a day in March, down from 25.95 million barrels a day in February, Conrad Gerber, the founder of PetroLogistics, said today. Members have a production target of 24.845 million barrels a day. Iraq has no quota. The reduction means that OPEC has completed 75 percent of the 4.2 million barrels a day of production cuts announced last year. At its latest meeting on March 15, the group resolved to meet its existing output targets and defer any further action to another gathering on May 28. Brent crude oil for May settlement fell $1.48, or 2.8 percent, to end the session at $51.98 a barrel on London’s ICE Futures Europe exchange. Oil may decline next week on speculation that U.S. oil and fuel inventories will increase because the recession has curbed demand and as the stock market rally loses steam. Sixteen of 30 analysts surveyed by Bloomberg News, or 53 percent, said futures will fall through April 3, the most bearish response since November. Nine respondents, or 30 percent, forecast oil prices will increase and five said that there will be little change. Crude oil volume in electronic trading on the Nymex was 279,043 contracts as of 3:05 p.m. in New York. Volume totaled 340,448 contracts yesterday, the lowest since Jan. 2, and 38 percent lower than the average over the past three months. Open interest yesterday was 1.16 million contracts. The exchange has a one-business-day delay in reporting open interest and full volume data. Gasoline and heating oil followed crude oil lower. Gasoline futures for April delivery fell 4.32 cents, or 2.8 percent, to end the session at $1.4879 a gallon in New York. Heating oil for April delivery declined 4.85 cents, or 3.3 percent, to settle $1.4328 a gallon. Regular gasoline at the pump, averaged nationwide, rose 1.7 cents to $2.026 a gallon, AAA, the nation’s biggest motoring organization, said today on its Web site. It’s the highest retail price since November. March 27 (Bloomberg) -- The dollar and yen rose as traders fled the euro and pound on evidence Europe’s recession is deepening. The 16-nation currency fell the most against the dollar in almost three months as industrial orders in the region plunged in January, adding to bets the European Central Bank will need to consider buying bonds to promote growth. The pound dropped to a one-week low as the U.K.’s economy contracted in the fourth quarter more than economists forecast. The euro decreased as much as 2 percent to $1.3257, the biggest intraday drop since Jan. 9, before trading at $1.3292 at 4:23 p.m. in New York. Europe’s currency extended its decline this week to 2.1 percent. The yen gained 2.5 percent to 130.15 per euro from 133.52. The dollar weakened 0.8 percent to 97.92 yen from 98.71. The pound lost 1.8 percent to 140.17 yen. The pound fell for a third day versus the dollar after a government report showed Britain’s gross domestic product contracted in the fourth quarter by a greater-than-forecast 1.6 percent, the biggest plunge since Margaret Thatcher was prime minister in the 1980s. Sterling weakened as much as 1.3 percent to $1.4269, the lowest level since March 19. The currency fell 1.7 percent versus the dollar in the first quarter for a third straight drop, the longest stretch of quarterly decline since 2005. The pound increased 0.7 percent to 92.96 pence per euro today. Industrial orders in the euro area fell 34 percent in January from a year earlier, the biggest drop since the data series started in 1996, a report from the European Union’s statistics office in Luxembourg showed today. Norway’s krone was the biggest gainer versus the dollar in the first quarter among the most actively traded currencies tracked by Bloomberg, advancing 5 percent as oil prices rose. The New Zealand and Australian dollars headed for their biggest monthly advances against the greenback in more than 20 years on commodity gains, advancing 14 percent to 56.99 U.S. cents and 8.3 percent to 69.31 U.S. cents, respectively. The New Zealand dollar in March erased 24 percent of its slump from a 26-year high reached on Feb. 27, 2008. Norway is the world’s fifth-largest oil producer, and New Zealand relies on sales of milk powder, butter, cheese and aluminum. Demand for Australian coal, iron ore and wool drove 17 consecutive years of economic expansion. The krone pared its quarterly gains today, dropping 1.9 percent to 6.6284 versus the greenback as Norges Bank Governor Svein Gjedrem said in an interview on Bloomberg Television yesterday that policy makers may bring the target lending rate below 1 percent if the Norwegian economy weakens more than expected. Citigroup Inc. said it ended a bet that the euro will strengthen against the dollar as pressure mounted on the ECB to follow the Federal Reserve in buying bonds to lower interest rates, a policy known as quantitative easing. The U.S. currency strengthened against most of its peers as stocks slid, increasing demand for safety. The Dow Jones Stoxx 600, a benchmark for Europe, fell 0.6 percent after a six-day rally. The Standard & Poor’s 500 Index lost 1.4 percent. The Dollar Index, which the ICE uses to track the greenback against the euro, yen, pound, Canadian dollar, Swiss franc and Swedish krona, climbed 1.2 percent today to 85.16 It fell to 82.63 on March 19, the lowest level since Jan. 9. Some analysts said the dollar may extend gains against the euro on speculation Group of 20 nations will fail to agree on measures to resolve the financial and economic crises when their representatives meet in London on April 2. German Finance Minister Peer Steinbrueck said the euro may be hurt if member states stray from the 27-nation European Union’s debt-limit rules as they combat the economic crisis. Germany has a “massive” interest in the EU’s Stability and Growth Pact limiting debt to 3 percent of gross domestic product, Steinbrueck told lawmakers in Berlin today. March 27 (Bloomberg) -- The dollar declined against the euro, paring a weekly gain, on speculation President Barack Obama will announce further aid to the U.S. auto industry, reducing demand for the U.S. currency as a refuge. The yen gained the most in a week against the greenback on speculation domestic companies are bringing home overseas earnings before the end of the fiscal year on March 31. The Australian and New Zealand dollars were poised for the biggest monthly gain versus the greenback in more than 20 years as stocks extended a worldwide rally to a third week and prices jumped for the commodities the two nations export. The dollar fell to $1.3578 versus the euro as of 7:02 a.m. in London from $1.3526 late yesterday in New York and $1.3580 on March 20. The greenback weakened to 97.80 yen from 98.71 yesterday. Japan’s currency also rose to 132.83 per euro from 133.52. The dollar traded at $1.4463 per pound from $1.4453. The Australia’s currency was at 69.82 U.S. cents from 70.16 cents yesterday, having gained 9.5 percent in March, the biggest monthly gain since February 1973. New Zealand’s dollar was at 57.44 U.S. cents from 57.55 U.S. cents yesterday, rising 15 percent this month. The Dollar Index headed for a third week of losses after Obama said yesterday he will outline his strategy for the automobile industry “in the next few days” and suggested he is open to providing automakers with more aid. General Motors Corp. and Chrysler LLC are operating with $17.4 billion in U.S. aid and have requested as much as $21.6 billion more. Obama’s auto task force is likely to recommend the government make more money available to carmakers, U.S. Senator Debbie Stabenow, a Michigan Democrat, told reporters. The Dollar Index, which the ICE uses to track the greenback against the euro, yen, pound, Canadian dollar, Swiss franc and Swedish krona, declined 0.4 percent today to 83.802. Demand for the yen was boosted on speculation Japanese companies and investors will repatriate earnings generated outside the nation before the fiscal year ends on March 31. The yen is still headed for a sixth weekly drop against the euro, the longest losing streak in eight months, as stocks rallied on optimism the worst of the global economic slump is over, sapping demand for the currency as a refuge. Demand for the Japanese and U.S. currencies has also waned as central banks cut interest rates and pumped cash into financial markets, boosting appetite for higher-yielding assets. The Nikkei 225 Stock Average gained 8.6 percent this week, the most in five months, after the Standard & Poor’s 500 Index advanced 2.3 percent yesterday. The Treasury Department announced earlier this week a scheme to fund purchases of as much as $1 trillion in toxic assets from banks. Gains in the yen were tempered after reports today showed consumer prices stalled in February and retail sales dropped the most in seven years. Prices excluding fresh food were unchanged from a year earlier, the statistics bureau said today in Tokyo. Retail sales declined 5.8 percent, the Trade Ministry said, more than the 3 percent economists predicted. The Bank of Japan’s Tankan index, which measures confidence among large makers of cars and electronics, slid to minus 55 this quarter from minus 24, the lowest level in more than 30 years, according to a Bloomberg survey before the April 1 report. A negative number means pessimists outnumber optimists. The yen fell 6.9 percent this month against the euro, heading for its biggest loss since a 10.8 percent decline in December 2000. Japan’s currency also headed for its first quarterly loss against the dollar since June, dropping 7.3 percent as Japan’s export-oriented economy shrank an annualized 12 percent last quarter, the biggest contraction since 1974. The euro may extend this month’s gains on speculation the European Central Bank won’t cut interest rates to zero and will avoid printing money to buy government bonds, maintaining the allure of the 16-nation region’s assets. Demand for Europe’s currency may also advance after ECB Governing Council member Ewald Nowotny said the bank’s liquidity-boosting measures are “sufficient” for now, in an interview with Der Standard that will be published today. “The ECB has indicated it won’t lower rates to zero and won’t adopt quantitative easing,” said Tsutomu Soma, a bond and currency dealer at Okasan Securities Co. in Tokyo. “This makes it easy to buy the euro,’ which may strengthen to $1.3620 and 133.90 yen today, he said. The ECB’s policy rate is 1.5 percent, compared with and zero to 0.25 percent in the U.S. and 0.1 percent in Japan. March 27 (Bloomberg) -- The yen headed for a sixth weekly drop against the euro, the longest losing streak in eight months, as stocks rallied on optimism the worst of the global economic slump is over, sapping demand for the currency as a refuge. Japan’s currency headed for its worst month against the euro since December 2000 as a report today showed retail sales fell the most in seven years. The Australian and New Zealand dollars headed for the biggest monthly gains since 1985 against the greenback as prices jumped for commodities the nations export. Demand for the yen and dollar has fallen as central banks cut interest rates and pumped cash into financial markets, boosting appetite for higher-yielding assets. The yen traded at 133.48 against the euro as of 11:53 a.m. in Tokyo from 133.52 late yesterday in New York and 130.29 a week ago. Japan’s currency was at 98.44 versus the dollar from 98.71 yesterday. The euro traded at $1.3561 from $1.3526. New Zealand’s dollar rose to 57.74 U.S. cents from 57.55 cents yesterday, while Australia’s currency was little changed at 69.99 U.S. cents from 70.16 cents. The Nikkei 225 Stock Average headed for a third weekly gain, adding 1.1 percent today, and the MSCI Asia Pacific Index of regional shares gained 1.0 percent. The Standard & Poor’s 500 Index advanced 2.3 percent yesterday. The Treasury Department announced earlier this week a scheme to fund purchases of as much as $1 trillion in toxic assets from banks. The yen has also lost its appeal as concern intensified about the deterioration of the world’s second-biggest economy. The yen fell 7.5 percent this month against the euro, heading for its biggest loss since a 10.8 percent decline in December 2000. Japan’s currency also headed for its first quarterly loss against the dollar since June, dropping 8.1 percent as Japan’s export-oriented economy shrank an annualized 12 percent last quarter, the biggest contraction since 1974. Europe’s currency may advance for a third week versus the dollar, its longest run since December, after ECB Governing Council member Ewald Nowotny said the bank’s liquidity-boosting measures are “sufficient” for now, in an interview with Der Standard that will be published today. The ECB offers to lend banks as much money as they want against eligible collateral for periods ranging from one week to six months. ECB Vice President Lucas Papademos said yesterday in Brussels the central bank may offer longer-term loans to banks and also may buy corporate debt to boost the region’s economy. The euro gained for a sixth week against the yen as the yield advantage of 10-year German bunds over Japanese government debt increased to 1.80 percentage points today from 1.70 percentage points on March 20. That’s the longest streak of gains since July, when the European Central Bank last raised its policy rate to 4.25 percent. The ECB’s policy rate is 1.5 percent, compared with 0.1 percent in Japan and zero to 0.25 percent in the U.S.
Demand for the yen may be boosted on speculation Japanese companies and investors will repatriate earnings generated outside the nation before the fiscal year ends on March 31. Japan’s currency was the biggest gainer in 2008 among the 171 currencies tracked by Bloomberg as the global financial meltdown led investors to buy assets perceived as safe. The Australian and New Zealand dollars also rose on speculation the countries’ central banks are close to ending the reductions in interest rates. Australia’s dollar appreciated 10 percent this month, the most since February 1973. New Zealand’s currency has gained 15 percent against the greenback, its largest advance since August 1985. Traders reduced to 25 basis points their expectations of the next cuts by policy makers in Australia and New Zealand, according to Credit Suisse Group AG indexes. Benchmark rates are 3.25 percent in Australia and 3 percent in New Zealand, compared with 0.1 percent in Japan and as low as zero in the U.S., attracting investors to the South Pacific nations’ higher-yielding assets. The risk in such trades is that currency market moves will erase profits. March 26 (Bloomberg) -- Cash bids for soybeans at export terminals near New Orleans narrowed their premium to Chicago Board of Trade futures as lower shipping costs boosts the amount of the grain available to exporters. The basis, or the cash-price spread with futures including storage and shipping costs, narrowed to 55 cents to 59 cents above the CBOT’s May contract from 59 to 61 cents yesterday, U.S. Department of Agriculture data show. The cost of moving grain by river from Chicago to New Orleans has dropped 52 percent in February and March to $15.66 per short ton (907 kilograms), USDA data show. Farmers sold 953,711 bushels of soybeans to Illinois River loading facilities from Chicago to St. Louis yesterday, up 47 percent from 648,216 bushels shipped a week earlier, the CBOT reported today on its Web site. Soybean futures for May delivery fell 7 cents, or 0.7 percent, to $9.44 a bushel. Chinese oilseed processors requested the government impose stiffer import taxes on soybeans. The most-active contract still has climbed 8.3 percent this month. More soybeans have been moving to U.S. ports because farmers need cash for fertilizer or to pay rent on land before planting the next crop, Jessen said. March 27 (Bloomberg) -- Crude oil was little changed near the highest in almost four months after the U.S. stock market advanced yesterday, signaling that fuel demand will increase. Oil climbed 3 percent yesterday as equities rallied on better-than-estimated earnings at Best Buy Co. and ConAgra Foods Inc. The average price of gasoline at the pump rose to $2 a gallon for the first time since November as U.S. supplies fell. “Oil is in the midst of a gentle upswing because there are finally glimmers of hope on the economic horizon,” said Michael Lynch, president of Strategic Energy & Economic Research, in Winchester, Massachusetts. Crude oil for May delivery fell 25 cents, or 0.5 percent, to $54.10 a barrel at 10:31 a.m. Sydney time on the New York Mercantile Exchange. The contract rose 3 percent to $54.34 yesterday, the highest settlement since Nov. 28. Prices are up 21 percent this year. The average price for regular gasoline at the pump nationwide rose 2.3 cents to $2.009 a gallon, AAA, the nation’s biggest motoring organization, said yesterday on its Web site. Gasoline inventories fell 1.14 million barrels to 214.6 million last week. The drop left supplies 0.4 percent lower than the five-year average for the week, the Energy Department said. U.S. oil supplies rose 3.3 million barrels to 356.6 million in the week ended March 20. It was the 22nd gain in 26 weeks and left stockpiles 13 percent higher than the five-year average for the period. Crude oil stockpiles at Cushing, Oklahoma, where New York- traded West Texas Intermediate crude is delivered, fell 2.21 million barrels to 31.7 million last week. Consumption of fuels rose 2.2 percent to 19.2 million barrels a day last week, yesterday’s Energy Department report showed. Daily fuel demand averaged over the past four weeks was 19.1 million barrels, down 3.2 percent from a year earlier. The Commerce Department said in a report yesterday that gross domestic product contracted at a 6.3 percent annual rate in the fourth quarter, less than the 6.6 percent forecast in a Bloomberg News survey. The Standard & Poor’s 500 Index added 2.3 percent to 832.86 yesterday. The gauge is up 13 percent in March. The Dow Jones Industrial Average increased 174.75 points, or 2.3 percent, to 7,924.56. The Organization of Petroleum Exporting Countries has agreed to production cuts of 4.2 million barrels a day since September after prices tumbled from record highs. The group decided against any further output constraints at a meeting in Vienna on March 15. OPEC will convene again there on May 28. OPEC will reduce crude-oil shipments by 3.3 percent in the month ending April 11, according to Oil Movements. Members will load 22.23 million barrels a day in the period, down from 23 million a day in the month ended March 14, the Halifax, England- based tanker tracker said in a report yesterday. March 27 (Bloomberg) -- The yen may fall against the euro for a third day on speculation Asian stocks will extend a worldwide rally on bets the worst of the global economic slump is over, adding demand for higher-yielding currencies. The Japanese currency headed for its worst month against the euro since 2000 as a government report today showed retail sales fell the most in seven years. New Zealand’s dollar gained after a government report showed the economy shrank 0.9 percent last quarter, while economists expected a 1.1 percent drop. The yen traded at 133.48 against the euro as of 8:52 a.m. in Tokyo from 133.52 late yesterday in New York. Japan’s currency was at 98.66 versus the dollar from 98.71. The euro traded at $1.3528 from $1.3526. New Zealand’s dollar rose to 57.66 U.S. cents from 57.55 cents yesterday. The Standard & Poor’s 500 Index climbed 2.2 percent yesterday and has gained 13 percent this month. The MSCI Asia Pacific index of regional shares gained 0.1 percent today. “We are seeing net selling of both the yen and the franc amid a pullback in risk aversion,” Samarjit Shankar, a strategist in Boston at Bank of New York Mellon, wrote in a note to clients. The company, which administers more than $20 trillion, aggregates the flows it observes in a daily report. The Swiss franc, which was also bought as a refuge from the global recession, lost as much as 2.8 percent yesterday to NZ$1.5417 and 2.3 percent to 8.2774 South African rand on reduced demand for safety. The Swiss National Bank started buying foreign currencies on March 12 to weaken the franc under plans to “forcefully relax” monetary conditions and end the country’s recession. The franc was headed for its worst month against the euro since November, declining 3.1 percent since the end of February. The yen fell 7.5 percent this month against the euro, heading for its biggest loss since a 10.8 percent decline in December 2000, as concern intensified about the health of the world’s second-biggest economy. Japanese retail sales fell 5.8 percent in February from a year earlier, after declining 2.4 percent in January, the Trade Ministry said in Tokyo. Consumer spending accounts for nearly 55 percent of Japan’s gross domestic product. A separate government report today showed prices excluding fresh food were unchanged last month from a year earlier, matching the median estimate of economists surveyed by Bloomberg. Senior Vice Finance Minister Koichi Hirata resigned yesterday after he sold 616 million yen ($6.2 million) of shares this month. Japan adopted a code of conduct in 2001 that advises government ministers not to directly trade securities. Finance Minister Shoichi Nakagawa quit last month amid accusations he was drunk at a press conference, raising questions about Prime Minister Aso Taro’s leadership of the ruling Liberal Democratic Party before elections that must be called by September. The yen headed for its first quarterly loss against the dollar since June, dropping 8.1 percent. The greenback gained 8.5 percent versus the yen in February as Japan’s export- oriented economy shrank an annualized 12 percent in the fourth quarter, the biggest contraction since 1974. FKLI March futures contract rebound mildly 2.5 points higher to close at 887 as compare to previous trading session with total 11869 lots traded in the market. FKLI was mainly traded sideways towards the upside. 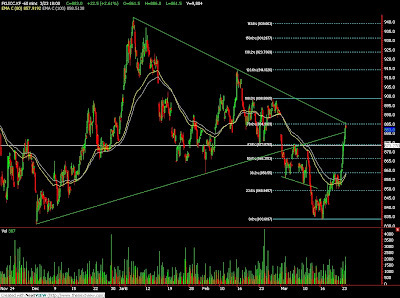 Technically, FKLI seems fails to breach resistance levels at 892 after several attempt to maintain above 892 regions. Based on FKLI hourly chart, we expect FKLI would trade lower in the coming trading session provided resistance levels at 892 and 900 were not violated. Traders were advice to hold short position in the coming trading session while be extra alert around support levels at 873 and 866 regions. FCPO 3rd month June Futures contract rose RM63 higher to close at RM2035 as compare to previous trading session with 9115 lots traded in the market. CPO price seems traded higher during the trading session due to strong soybean oil and crude oil electronic trading during the trading session. Technically, CPO price to close on 50% Fibonacci projection at RM2035 after manage to build a base around RM1980 regions. We expect CPO price would trade higher in the coming trading session provided if support levels at RM1950 and RM1920 were not violated. Traders were advise to hold long position in the coming trading session while be extra alert around resistance levels at RM2053, RM2080 and RM2113levels. MUMBAI, March 26 (Reuters) - Indian soyoil futures rose on Thursday afternoon on firm Malaysian palm oil and tracking seven-day farmers' strike in Argentina, a leading exporter, which entered its fifth day on Wednesday. By 2:19 p.m. (0849 GMT), the April contract NSOJ9 rose 0.4 percent to 447.85 rupees ($8.9) per 10 kg on the National Commodity and Derivatives Exchange. The May contract NSOK9 rose 0.5 percent to 444.7 rupees. Prices in the spot market in Indore, a hub for soyoil trade in India, was steady at 43,200 rupees per tonne. Firm Malaysian palm and U.S. soyoil supported the soyoil prices. The benchmark June palm oil futures KPOc3 on Bursa Malaysia Derivatives Exchange was up 1.77 percent at 2,007 ringgit a tonne at 0853 GMT. However markets may turn bearish on expectations of a surge in soyoil imports, after government formally abolished a 20 percent duty on crude soyoil imports, early this week, and on a rise in rapeseed oil supplies, a substitute for soyoil, analysts said. "Prices may see a downward trend from next week after rapeseed oil supplies rise," said a trader in western state of Rajasthan, the largest producer. March 26 (Bloomberg) -- Supplies of vegetable oil in India, the world’s biggest buyer after China, may increase as importers take benefit of duty free purchases of palm and soybean oils, likely hurting domestic oilseed prices. Edible oil stockpiles may triple to as much as 1.5 million tons in the year to Oct. 31, said Davish Jain, president of the Central Organization for Oil Industry and Trade, the country’s biggest group of oilseed processors and traders. Unbridled imports of palm and soybean oils may depress local prices of the edible oils, discouraging farmers to plant oilseeds including peanuts and mustard seeds. India relies on overseas purchases to meet almost half its cooking fat demand. India’s government March 24 scrapped a 20 percent duty on imports of crude soybean oil, four months after it was imposed to shield oilseed growers. The decision brings soybean oil back in line with palm oil, a main substitute product, which had been exempted from the tax. Vegetable-oil imports may reach 7.2 million tons in the year to October, up 14 percent from a year ago, B.V. Mehta, executive director of the Solvent Extractors’ Association, said. Purchases surged 68 percent to 2.95 million tons in the four months ended February from a year ago, the association said. June-delivery palm oil increased as much as 1.6 percent to 2,004 ringgit ($552) a ton in Kuala Lumpur, extending the year- to-date gain to 18 percent. Soybean oil futures for May delivery added 0.5 percent to 33.53 cents a pound in Chicago, its sixth straight day of gains. India buys palm oil from Indonesia and Malaysia, and soybean oil from Argentina and Brazil. The price of mustard seed, which will be harvested this month, added as much as 0.4 percent to 457.65 rupees per 20 kilograms on the National Commodity Exchange & Derivatives Ltd. in Mumbai. Still, the oilseed has lost 25 percent in the past six months. Refined soybean oil gained as much as 0.6 percent to 448.6 per 10 kilograms. India’s production of oilseeds may be 24.65 million tons in the year ending June 30, little changed from 24.59 million tons a year-earlier period, the Central Organization for Oil Industry & Trade said March 22. March 26 (Bloomberg) -- The yen fell for a second day against the euro on speculation government reports will show the recession in Japan is deepening, reducing demand for the currency as a refuge from the financial turmoil. The dollar is poised for a third weekly decline against the euro on concern Federal Reserve officials speaking today will indicate the central bank is determined to keep borrowing costs low to help revive the economy. Australia’s dollar strengthened for a second day against the greenback on expectations a rebound in commodity prices will boost the resource-rich economy. The yen declined to 133.04 per euro as of 10:21 a.m. in Tokyo from 132.48 late in New York yesterday. The Japanese currency weakened to 97.72 per dollar from 97.54. The dollar traded at $1.3616 per euro from $1.3583 yesterday. The Australian dollar climbed to 70.11 U.S. cents from 69.78 cents yesterday, and the New Zealand dollar strengthened to 57.03 U.S. cents from 56.61. The yen fell against all of the 16 most-active currencies today before the trade ministry’s retail sales report tomorrow. Sales fell 3 percent in February from a year earlier, after declining 2.4 percent the prior month, according to a Bloomberg News survey of economists. The Bank of Japan’s Tankan index, which measures confidence among large makers of cars and electronics, slid to minus 55 this quarter from minus 24, the lowest level in more than 30 years, according to a separate Bloomberg survey before the April 1 report. A negative number means pessimists outnumber optimists. Gains of the euro may be limited by speculation European Central Bank Executive Board member Jose Manuel Gonzalez-Paramo will signal additional interest-rate reductions when he speaks today in Valencia, Spain. ECB President Jean-Claude Trichet said this week the 1.5 percent main refinancing rate may be cut further as policy makers work to counter the global economic slump. The ECB is expected to lower rates by half a percentage point at their April 2 policy meeting, according to another Bloomberg survey. The euro is poised to fall for a fourth quarter against the dollar, the longest streak of losses in three years. The Dollar Index fell for a second day after San Francisco Fed President Janet Yellen said in a speech in New York yesterday there are “severe” risks warranting whatever policies are needed to revive growth. Dallas Fed President Richard Fisher speaks at 12 p.m. in Dayton, Ohio, and Richmond Fed President Jeffrey Lacker delivers a speech at 12:30 p.m. in Charleston, South Carolina. The Dollar Index, which the ICE uses to track the greenback against the euro, yen, pound, Canadian dollar, Swiss franc and Swedish krona, declined 0.2 percent to 83.677. Losses in the dollar may be limited after Treasury Secretary Timothy Geithner predicted the greenback will maintain its role as the world’s primary reserve currency, clarifying earlier comments on a Chinese proposal to overhaul the global monetary system. Zhou said March 23 in a report posted on the bank’s Web site that special drawing rights, monetary units valued against a composite of currencies, should also be used for international trade, financial transactions and commodity pricing. The IMF should aim in the longer term to create a “super-sovereign reserve currency,” Zhou said. The dollar has risen 7.8 percent against the yen this year, heading for the best quarterly performance since the final three months of 2001. MUMBAI, March 25 (Reuters) - Adani Wilmar Ltd, India's leading branded edible oils firm, is planning to double imports of palm oil products to about 100,000 tonnes a month by 2012, its managing director said on Wednesday. The imports would mostly go into the company's newly launched brands including Raag Gold, targetted at rural segment, Pranav Adani, told reporters on the sidelines of a press conference to launch new edible oil brands. "We are targetting the price conscious rural masses with branded refined palmolein. This will require us to import more palm oil," Adani said. The firm, a joint venture between Gujarat-based Adani Group and Wilmar International Ltd, currently imports less than 50,000 tonnes of crude palm oil a month. It also imports crude soyoil and sunflower oil and crushes locally produced oilseeds like rapeseed and soybean, Adani said. The rise in imports is in-line with the company's plans to double its overall capacity to about 2.5 million tonnes a year at an estimated investment of 6.5 billion rupees. "By this year end we plan to raise imports of palm products to about 60,000-65,000 tonnes," Adani said. The company has oilseed crushing units in Madhya Pradesh and Rajasthan. Procuring soybean for its crushing units was difficult this year as prices remained high and many farmers continued to hold on to the produce for a longer span hoping for a better price, Adani said. The higher oilseed prices and a fall in refined edible oil prices have put some pressure on the margins of the edible oil firms, Adani said. March 26 (Bloomberg) -- Crude oil was little changed after falling yesterday on a government report that showed U.S. inventories climbed to the highest since 1993 because of deteriorating demand. Supplies rose 3.3 million barrels to 356.6 million last week, the Energy Department said yesterday. Inventories were forecast to increase by 1.1 million barrels, according to a Bloomberg News survey. Stockpiles of gasoline and distillate fuel, a category that includes heating oil and diesel, dropped as refineries cut operating rates. Crude oil for May delivery rose 8 cents, or 0.2 percent, to trade at $52.85 a barrel at 9:37 a.m. Sydney time on the New York Mercantile Exchange. May futures fell $1.21, or 2.2 percent, to settle at $52.77 a barrel yesterday. Prices are up 19 percent this year. The inventory gain was the 22nd in 26 weeks. The increase left supplies 13 percent higher than the five-year average for the period, the department said. Imports of crude oil increased 204,000 barrels a day to 9.38 million in the week ended March 20, the highest level in six weeks, the report showed. Stockpiles at Cushing, Oklahoma, where New York-traded West Texas Intermediate crude is delivered, fell 2.21 million barrels to 31.7 million last week. Supplies in the week ended Feb. 6 were the highest since at least April 2004, when the Energy Department began keeping records for the location. Consumption of fuels rose 2.2 percent to 19.2 million barrels a day last week. Total daily fuel demand averaged over the past four weeks was 19.1 million barrels, down 3.2 percent from a year earlier. Refineries operated at 82 percent of capacity, down 0.1 percentage point from the prior week, the Energy Department said. Gasoline stockpiles dropped 1.14 million barrels to 214.6 million last week. The decline left inventories 0.4 percent lower than the five-year average for the week, the department said. A 650,000-barrel drop was forecast, according to the median of 14 analyst responses in a Bloomberg News survey. Distillate supplies declined 1.58 million barrels to 143.9 million, leaving stockpiles 25 percent above the five-year average for the period. A 100,000-barrel drop was forecast. The Organization of Petroleum Exporting Countries agreed to hold output targets steady at its meeting in Vienna on March 15 on concern higher prices may harm an ailing global economy. Ministers pledged to tighten compliance with record cutbacks agreed on last year to bolster prices. Total SA, Europe’s third-largest oil company, is shutting output at its Port Arthur, Texas, refinery in response to weakening demand. The company said in a filing with the Texas Department of Environmental Quality March 24 that it began closing units at the facility. “The U.S. market has deteriorated a lot and we are adjusting to this,” Total spokesman Michael Crochet-Vourey said by telephone in Paris yesterday. Production at the facility, which has the capacity to process 240,000 barrels of oil a day, will be stopped for weeks, United Steelworkers union members who work at the plant said. March 26 (Bloomberg) -- The dollar may extend its decline against the euro on speculation an unexpected increase in U.S. new-home sales and durable-goods orders will reduce demand for the greenback as a refuge from global economic turmoil. The 16-nation currency may strengthen for a second day against the yen on expectations Asian stocks will rise as risk appetite improves, hurting the appeal of Japan’s low-yielding currency. The dollar traded at $1.3588 per euro at 8:16 a.m. in Tokyo from $1.3583 late in New York yesterday, when it weakened as much as 1.2 percent, the biggest intraday decline since March 19. The dollar was at 97.56 yen from 97.54 yen. The euro traded at 132.56 yen from 132.48. U.S. stocks rose, extending the best monthly rally in 17 years for the Standard & Poor’s 500 Index, which added 1 percent to 813.88 yesterday. It has jumped almost 11 percent in March for its best gain since 1991. New-home sales in the U.S. increased 4.7 percent last month from a record low pace in January, a Commerce Department report yesterday showed, compared with a 2.9 decrease forecast by economists. Orders for durable goods climbed 3.4 percent in February, the biggest gain in more than a year, according to a separate report from the department. Dollar losses may be limited after Treasury Secretary Timothy Geithner predicted the greenback will maintain its role as the world’s primary reserve currency, clarifying earlier comments on a Chinese proposal to overhaul the global monetary system. Demand for the yen may decline before a government report tomorrow that economists say may show Japan’s consumer prices were unchanged for a second month in February as the nation’s recession deepened. Prices excluding fresh food were unchanged last month from a year earlier, according to the median estimate of 31 economists surveyed by Bloomberg News. The statistics bureau publishes the report tomorrow at 8:30 a.m. in Tokyo. The closely-watched Tankan index of the Bank of Japan measuring confidence among large makers of cars and electronics dropped to minus 55 from minus 24, according to the median estimate of economists surveyed by Bloomberg News. A negative number means pessimists outnumber optimists. The report will be released April 1. FKLI March futures contract rebound 8 points higher to close at 884.5 as compare to previous trading session with total 7030 lots traded in the market. 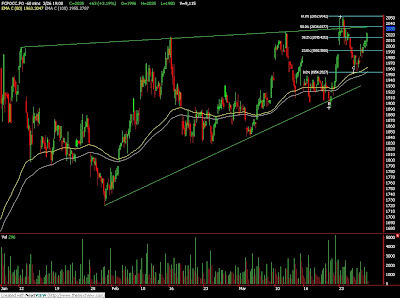 FKLI manage to rebound after long consolidation around 876 regions. 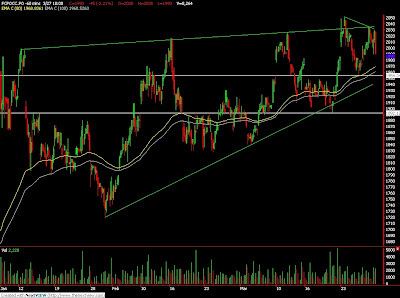 Technically, FKLI seems holding well above 873 levels during the trading session. 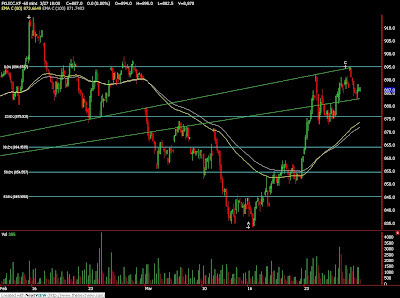 Its possible FKLI might challenge resistance levels at 888 and 899 regions in the coming trading session. 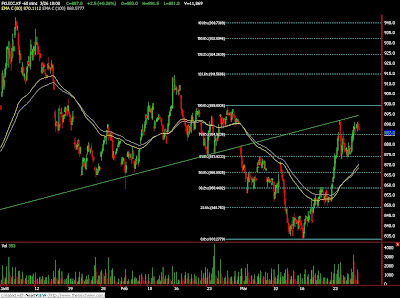 Failure to resist FKL price below these resistance levels would indicate buying signal. However, traders were still advice to hold short position in the coming trading session provided support levels at 873 and 866 were violated. FCPO 3rd month June Futures contract fall marginally RM8 lower to close at RM1972 as compare to previous trading session with 5763 lots traded in the market. CPO price seems traded sideways throughout the trading session despite soybean oil and crude oil were traded lower during the trading session. 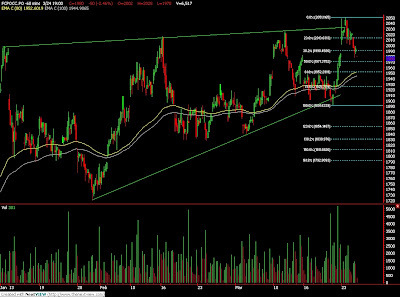 Technically, CPO price seems temporary support above 61.8% Fibonacci retrace levels at RM1950 levels while CPO price still remain trading within rising wedge formation. We expect CPO price would trade higher in the coming trading session provided support levels at RM1950 and RM1910 were not violated. Failure to hold against the selling pressure above the support levels shall indicate massive selling signal towards RM1750 regions. Traders were advice to hold long position in the coming trading session while be alert on the resistance levels at RM1980 and RM2030 regions. NEW DELHI, March 25 (Reuters) - The Indian government has issued a formal order to abolish a 20 percent import tax on crude soyoil, a senior government official said on Wednesday. "Orders have been issued and a notification on the official website should be uploaded anytime," the official at the Central Board of Excise and Customs said, confirming a report in the Hindu Business Line newspaper. Imports of crude palm oil are not taxed, while that of refined vegetable oils attract a duty of 7.5 percent. March 24 (Bloomberg) -- Gold fell the most in almost a week on speculation that a U.S. government plan to rid banks of toxic assets will revive lending and the economy, eroding the appeal of the precious metal. Silver also declined. Investment in the SPDR Gold Trust, the biggest exchange- traded fund backed by bullion, dropped from a record yesterday for the first time since March 6. The U.S. Treasury’s latest bid to help banks boosted optimism that the economy will recover from the biggest recession since the Great Depression, spurring gold sales. Before today, gold rose 7.7 percent this year. “Let’s not forget that gold is one of the best barometers of pessimism still out there,” said Jon Nadler, an analyst at Kitco Inc. in Montreal. Gold gained this year as investors bought the metal as a store of value against financial turmoil, analysts said. Gold futures for April delivery fell $28.70, or 3 percent, to $923.80 an ounce on the Comex division of the New York Mercantile Exchange, the biggest decline for a most-active contract since March 18. Silver futures for May delivery dropped 51.8 cents, or 3.7 percent, to $13.357 an ounce on the Comex. Silver still has gained 18 percent this year while gold is up 4.5 percent. The precious metals fell as equities climbed in Europe and Asia, while in New York the Standard & Poor’s 500 Index pulled back from yesterday’s 7.1 percent gain. Still, the S&P pared an earlier drop of as much as 1.6 percent. Yesterday’s rally in U.S. equities was the biggest in five months. Investment in the SPDR Gold Trust dropped from a record 1,114.6 metric tons to 1,114.3 tons yesterday. The fund still has grown 43 percent this year. A decline in gold prices may present a buying opportunity for investors seeking a hedge against inflation, analysts said. Last week, the Federal Reserve announced plans to expand its balance sheet by as much as $1.15 trillion to buy long-term debt and mortgages. The Reuters/Jefferies CRB Index of 19 commodities has climbed 5.1 percent in the past week, paced by an 8.6 percent rise in crude oil. March 25 (Bloomberg) -- Crude oil was little changed from its highest close in four months after the U.S. stock market declined yesterday following calls by the nation’s two top banking officials for stronger regulation of financial firms. Oil had climbed on speculation that an Energy Department report later today will show that U.S. supplies of gasoline and distillate fuel declined. Gasoline stockpiles dropped 650,000 barrels last week, according to the median of 14 responses in a Bloomberg News survey. Oil “traded down in the after-hours market, receiving pressure from the 115 point drop in the Dow Jones,” said Mike Sander, an investment adviser at Sander Capital Advisors Inc. in Seattle. Crude oil for May delivery fell 38 cents, or 0.7 percent, to $53.60 a barrel at 9:39 a.m. Sydney time on the New York Mercantile Exchange. In New York yesterday, May futures rose 18 cents to $53.98 a barrel, the highest settlement since Nov. 28. The Standard & Poor’s 500 Index lost 2 percent to 806.25 yesterday after its fourth-biggest rally since the 1930s. The Dow Jones Industrial Average slid 115.89 points, or 1.5 percent, to 7,659.97. Federal Reserve Chairman Ben S. Bernanke and Treasury Secretary Timothy Geithner called yesterday for new powers to take over and dismantle failing financial firms after the troubled rescue of American International Group Inc.
Oil futures had been buoyed by expectations that supplies of distillate fuel, a category that includes heating oil and diesel, probably fell 100,000 barrels last week. “The product markets are providing some support for crude,” said Tom Bentz, a senior energy analyst at BNP Paribas Commodity Futures Inc. in New York. Crude oil stockpiles rose 1.1 million barrels in the week ended March 20 from 353.3 million the previous week, according to the Bloomberg survey. Inventories in the week ended March 13 were the highest since June 2007. The Energy Department is scheduled to release its weekly supply report today at 10:30 a.m. in Washington. Crude oil stockpiles rose 4.58 million barrels to 354.5 million in the week ended March 20, a report by the industry- funded American Petroleum Institute showed. The API inventory report was released yesterday at 4:30 p.m. in Washington. The Organization of Petroleum Exporting Countries, the International Energy Agency and the U.S. Energy Department cut their 2009 forecasts for oil demand this month. OPEC, the IEA and DOE see consumption slumping more than 1 million barrels a day this year. OPEC agreed to hold output targets steady at its meeting in Vienna on March 15 on concern higher prices may harm an ailing global economy. Ministers pledged to tighten compliance with record cutbacks agreed on last year to bolster prices. “OPEC countries can do very little to push prices up,” former Saudi Arabian Oil Minister Sheikh Ahmad Zaki Yamani said today at a seminar organized by the London-based Centre for Global Energy Studies. A reversal of the global economic recession would boost prices, he said. Oil prices of $40 a barrel are too low, and a range between $60 and $75 is needed to allow output of higher-cost oil, Saudi Arabian Oil Minister Ali al-Naimi said last week in Geneva. Crude-oil demand is set to “collapse” in the second quarter as refiners trim imports for seasonal maintenance, Edward Morse, head of economic research at LCM Commodities LLC, said at the CGES conference. U.S. government measures to resolve the financial crisis have helped prices stabilize and will likely prevent a drop toward $30 a barrel, he said. Brent crude oil for May settlement declined 3 cents to end the session yesterday at $53.50 a barrel on London’s ICE Futures Europe exchange. March 25 (Bloomberg) -- The yen weakened against the euro and the dollar after a government report showed the export- oriented economy posted the biggest-ever decline in overseas shipments, signaling reduced demand for the nation’s goods. The currency fell for a fourth day against the greenback as the finance ministry report showed the recession sapped demand for Japan’s cars and electronic goods. Sterling may gain for a third day against the dollar after the U.K. inflation rate quickened, adding to bets the Bank of England will tolerate a stronger pound. The greenback may rise after Nobel Prize-winning economist Paul Krugman said the government will have to seize major lenders, spurring demand for the safety of the dollar. “The trade report should bode ill for the yen as it reduces demand” for the yen, said Yousuke Hosokawa, a senior currency dealer at Chuo Mitsui Trust and Banking Co. in Tokyo. The yen dropped to 132.47 per euro as of 9:08 a.m. in Tokyo from 131.81 late in New York yesterday, when it touched 134.51, the weakest level since Oct. 21. The yen declined to 98.21 against the dollar from 97.86. The dollar traded at $1.3490 per euro from $1.3468. The greenback reached $1.3738 on March 19, the weakest level since Jan. 9. Japan’s exports dropped 49.4 percent in February from a year earlier, the sharpest decline since at least 1980, when the government started to keep comparable data, the Finance Ministry said today in Tokyo. The pound was at $1.4704 from $1.4681 yesterday, when it touched $1.4778, the highest level since Feb. 10, after an Office for National Statistics report showed annual consumer inflation unexpectedly accelerated. Consumer prices in the U.K. climbed 3.2 percent last month from a year earlier after a 3 percent increase in January. The median forecast of economists surveyed by Bloomberg was for a 2.6 percent pace. The pound rose for a fourth day against the yen on speculation Japanese investors will seek higher-yielding assets elsewhere. Sterling rose 0.6 percent to from 144.60 yen yesterday and Brazil’s real advanced 0.5 percent to 43.7075 versus the yen. Japan’s target lending rate of 0.1 percent compares with 11.25 percent in Brazil and 0.5 percent in the U.K. The Dollar Index, which the ICE uses to track the greenback against the euro, yen, pound, Canadian dollar, Swiss franc and Swedish krona, gained 0.3 percent to 84.115 after reaching 82.63 on March 19, the lowest level since early January. The Standard & Poor’s 500 Index fell 2 percent and the MSCI World Index lost 0.7 percent yesterday after Krugman said in an interview with Bloomberg Television the financial crisis will force the government to take over big banks. He also predicted the U.S. economy, which shrank 6.2 percent last quarter, won’t stabilize until late this year. FKLI March futures contract fall 6.5 points lower to close at 876.5 as compare to previous trading session with total 8367 lots traded in the market. FKLI plunge despite opened high around 890 regions due to Dow Jones overnight strong closing after favorable news were released during the trading session. Technically, FKLI plunge after forms a Doji in the hourly price chart. 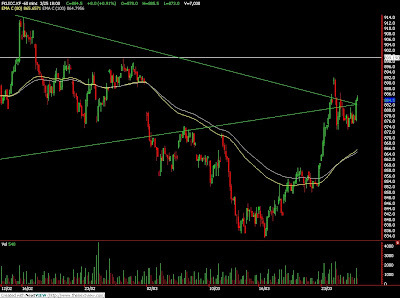 We still expect FKLI would trade lower in the coming trading session while resistance levels still remain at 886 and 899 regions despite of short false break period during the morning trading session. Traders were advice to hold short position in the coming trading session by being extra alert around support levels at 874 and 866 regions. FCPO 3rd month June Futures contract plunge RM50 lower to close at RM1980 as compare to previous trading session with 6517 lots traded in the market. CPO price falls after disappointment for soybean oil and crude oil overnight weak performance despite CPO price surge up in the previous trading sessions. 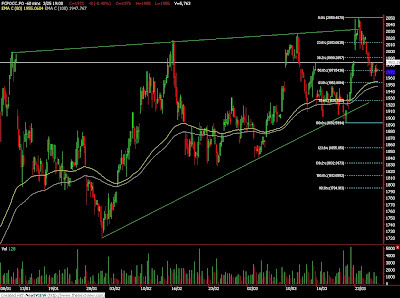 Technically, it appears the CPO price fails to breach resistance trend line of the rising wedge. 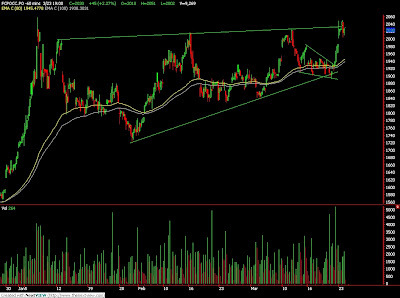 We expect CPO price would trade within the rising wedge price range in the coming trading with resistances seen at RM2050 and RM2000 region. However, traders were advice to hold long position in the coming trading session provided support levels at RM1950 and RM1900 were not violated. MUMBAI, March 24 (Reuters) - India soyoil, soybean, and rapeseed futures may rise early on Tuesday tracking overnight gains in U.S. markets and due to the ongoing strike in Argentina, where farmers are protesting against soy taxes, analysts said. Crude oil prices CLc1, which edged near $54 a barrel, are also seen supporting prices as a firm crude may push up demand for oilseeds and soyoil from the bio-fuel sector. The oilseeds and soyoil markets had ended up in the previous day's trade. However, arrivals of rapeseed in the spot market and lacklustre trade in palm oil in Malaysia may limit the gains, theya added. March 24 (Bloomberg) -- Crude oil was little changed from its highest close in almost four months after the U.S. stock market advanced, signaling that fuel use in the world’s biggest energy-consuming country will rebound. Oil climbed 3.3 percent yesterday after equities increased on speculation that the Obama administration’s plan to rid banks of distressed assets will spur growth. Stock and commodity markets extended gains after a report showed that U.S. sales of previously owned homes unexpectedly climbed in February. Crude oil for May delivery rose 4 cents to $53.84 a barrel at 9:19 a.m. Sydney time on the New York Mercantile Exchange. Prices are up 21 percent this year. Yesterday, oil gained $1.73 to $53.80 a barrel, the highest settlement since Nov. 28. The Standard & Poor’s 500 Index increased 7.1 percent yesterday to 822.92, the biggest increase since Oct. 28. The Dow Jones Industrial Average rose 6.8 percent to 7,775.86. Home purchases increased 5.1 percent to an annual rate of 4.72 million from 4.49 million in January, the National Association of Realtors said yesterday in Washington. The Treasury plan is aimed at financing as much as $1 trillion in purchases of illiquid real-estate assets, using $75 billion to $100 billion of the Treasury’s remaining bank-rescue funds. The Public-Private Investment Program will also rely on Federal Reserve financing and Federal Deposit Insurance Corp. debt guarantees, the Treasury said in a statement in Washington. The announcement provides details on an initial strategy laid out by Treasury Secretary Timothy Geithner last month, which caused a slump in stocks because it lacked an explanation of how the effort would work. Brent crude oil for May settlement advanced $2.25, or 4.4 percent, yesterday to $53.47 a barrel on London’s ICE Futures Europe exchange. Prices ended the session at the highest level since Nov. 28. Suncor Energy Inc., the world’s second-largest oil-sands producer, agreed to buy Petro-Canada for C$19.3 billion ($15.6 billion) in a record takeover that will create the biggest Canadian energy company. It will yield savings and help Suncor shoulder high-cost oil-sands projects in northern Alberta. The Organization of Petroleum Exporting Countries has reduced daily output targets by 4.2 million barrels since September in an effort to increase prices. The group held quotas steady at a meeting on March 15, pledging that members will tighten compliance with previous agreements. OPEC, the International Energy Agency and the U.S. Energy Department cut their 2009 forecast for oil demand this month. OPEC, the IEA and DOE see consumption slumping more than 1 million barrels a day this year. March 24 (Bloomberg) -- The yen traded near a five-month low against the euro and the dollar was close to the weakest in two months versus the 16-nation currency, on bets U.S. plans to help banks dispose of toxic assets will reduce demand for safety. The euro may extend its advance against the greenback after Treasury Secretary Timothy Geithner unveiled proposals to remove bad debt from the books of banks to spur them to resume lending. Asian currencies may extend gains on speculation the region’s stocks will advance as concerns ease about global financial turmoil, enhancing demand for higher-yielding assets. The yen traded at 132.17 per euro at 8:06 a.m. in Tokyo, unchanged from late yesterday in New York. It touched 132.57, the weakest level since Oct. 21. The yen was at 96.98 per dollar from 96.95. The dollar traded at $1.3634 against the euro from $1.3633. The greenback reached $1.3738 on March 19, the weakest level since Jan. 9. The U.S. currency fell 0.5 percent yesterday against the Dollar Index, which the ICE uses to track the greenback against the euro, yen, pound, Canadian dollar, Swiss franc and Swedish krona, after plunging last week when the Federal Reserve said it would start buying Treasuries. The Dollar Index, dropped 4.1 percent last week, the biggest decrease since September 1985. That’s when the U.S., U.K., France, Japan and West Germany agreed at New York’s Plaza Hotel to coordinate the dollar’s devaluation versus the yen and deutsche mark. The gauge for the greenback has fallen 5.1 percent in March, paring its gain this quarter to 2.7 percent. The U.S. currency slid almost 5 percent versus the euro last week, its biggest decline since mid-December, after the Fed unexpectedly announced on March 18 that it would buy as much as $300 billion of Treasuries and increase purchases of agency mortgage-backed securities to lower consumer borrowing costs, a policy known as quantitative easing. Gains in the euro may be tempered by speculation the dollar’s decline has gone too far. The 14-day relative strength index on the 16-nation currency versus the greenback, a gauge used by traders and analysts to project trends, rose yesterday to 71.6, near the highest level in three months. A level above 70 tends to signal a currency’s gain is too fast to sustain. The U.S. currency will strengthen to $1.29 per euro by the end of the second quarter, Chandler forecasts. The Standard & Poor’s 500 Index advanced 7.1 percent yesterday, the most since Oct. 28, on the Treasury’s plan to finance as much as $1 trillion in purchases of distressed assets. Demand for the euro may rise on speculation that European Central Bank President Jean-Claude Trichet will reiterate his reluctance to lower interest rates when he speaks today in Mexico City. The ECB president said zero interest rates have “drawbacks” and would not be appropriate, in an interview with the Wall Street Journal published this week. The ECB cut the main refinancing rate to a record low of 1.5 percent on March 5 to stem the worst recession since World War II. NEW DELHI, March 23 (Reuters) - India's vegetable oil traders have stopped striking deals to import crude soyoil, usually shipped from Brazil and Argentina, because of uncertainty over changes in import tax, traders said on Monday. India's trade secretary announced a cut in the import tax on crude soyoil last Thursday, but a formal order to change the levy has still not been issued. "No deals are happening as uncertainty prevails in the market," Sandeep Bajoria, a leading trader and a former president of the Solvent Extractors' Association of India, told Reuters. Traders say they need a formal government order despite the announcement. "Traders are eagerly awaiting the official order on the tax withdrawal. The vegetable oil trade is interested to know whether any rider has been attached to the announced tax cut," said B.V. Mehta, executive director of Solvent Extractors' Association. Mehta said the official order might be issued soon. In a similar situation, the government eased import rules for raw sugar last month, but the formal order, on the basis of which traders could import, was issued two weeks after the trade minister announced the change. India, a net edible oil importer, buys mainly palm oil from Indonesia, Malaysia, and a small quantity of soy oil from Brazil and Argentina. FKLI March futures contract surge 22.5 point higher to close at 883 as compare to previous trading session with total 9804 lots traded in the market. FKLI surge up during trading session due to news release regarding US government to bailout on bank bad asset. FCPO 3rd month June Futures contract rose RM45 higher to close at RM2030 as compare to previous trading session with 9269 lots traded in the market. CPO price surge after crude oil and soybean oil electronic trading open and traded higher before CPO was start traded. Technically, CPO price manage to complete 50% Fibonacci projection at RM2049 levels and encounter great selling pressure around the resistance trend line. We expect CPO price would trade lower into the rising wedge trading range provided resistance levels at RM2050 and RM2087 were not violated. Trader were advice to hold short position in the coming trading session while be extra cautious around support levels at RM1910 and RM1960 region. MUMBAI, March 23 (Reuters) - India soyoil, soybean, and rapeseed futures were up on Monday morning tracking firm crude oil prices and gains in Malaysian palm oil and U.S. soybean and soyoil futures, analysts said. At 10:22 a.m., May soybean NSBK9 on the National Commodity and Derivatives Exchange rose 0.96 percent to 2,322.5 rupees per 100 kg, while May soyoil NSOK9 was up 0.67 percent at 444.15 rupees per 10 kg. Rapeseed June futures NRSM9 rose 0.32 percent to 463.3 rupees per 20 kg. At 10:00 a.m., benchmark June palm oil KPOc3 on the Bursa Malaysia Derivatives Exchange was up 2.12 percent at 2,027 ringgit a tonne. The contract had earlier touched a new high of 2,049 ringgit. July soybean futures SN9 on the Chicago Board of Trade was up 1.82 percent at $9.66-¼ a bushel, while July soyoil BON9 was up 1.69 percent at 33.07 cents per pound during electronic trade. Crude oil prices CLc1 rose to cross $52 per barrel mark raising expectations of demand for biofuels globally. JAKARTA (Reuters) - Sinar Mas Group, one of Indonesia's top palm oil growers, denied on Friday accusations that its activities were damaging the environment and said it would stick to plans to expand its plantations. Greenpeace activists have targeted Sinar Mas in a recent campaign for contributing to deforestation in Indonesia, which is blamed as a key source greenhouse gas emissions in the Southeast Asian country. "We should have been arrested if we had ever been involved in deforestation," Gandi Sulistiyanto, a managing director of Sinar Mas Group, told Reuters. He said the company only opened up new plantations in degraded land that had been farmed on or previously logged and not rainforest. Sinar Mas Group owns publicly-listed PT Sinar Mas Agro Resources Tbk (SMART), which runs its palm oil business, and Asia Pulp & Paper (APP), which operates the pulp and paper business. Bustar Maitar, Greenpeace Southeast Asia forest campaigner, accused Sinar Mas of destroying forest areas. "We are facing the greatest threat to humanity -- climate chaos, yet still companies like Sinar Mas can continue to destroy forests and peatlands, rather than protecting them for future generations," Maitar said in a statement. As of the end of September, SMART managed 127,124 hectares (314,100 acres) of planted oil palm, according to the company. It produced 410,314 metric tons of crude palm oil in January-September last year, against 509,095 metric tons in all of 2007. The group has earmarked a $100 million palm expansion this year and is not planning to pull back the plan. "We are still a growing company. We (Indonesia) are still competing with Malaysia to become the world's top producer of palm oil. So we must keep planting," Sulistiyanto said. He said the current financial crisis may slow down the expansion but would not stop the firm from planting in new areas. According to Greenpeace, Sinar Mas has 200,000 hectares of unplanted concessions in rainforest in Indonesia and plans to acquire an additional 1.1 million hectares, mainly in Papua. Sulistiyanto said the firm was currently focused on managing the 11,000 hectares that it has planted with oil palm in the past 14 years in Papua. "Everybody is eyeing Papua because of its huge land but we haven't got any more concessions there," he said. Indonesia, the world's top producer of palm oil -- used in a wide range of products, from soap to biodiesel -- is expected to produce 20.25 million metric tons of palm oil in 2009, up from 18.8 million in 2008, the industry association has estimated. Annette Cotter, campaign manager for the forests campaign in Greenpeace Southeast Asia, has urged Indonesia palm growers to squeeze far higher yields from existing plantations rather than open up more land. Indonesia yields only about 2 tons per hectare from its plantations, or just a third of the 6 to 7 tons in countries such as Malaysia with better estate management practices.